She had watched the paint gradually peel away from her Elbur Avenue home for years, dreaming of a new paint job and unsure of where to turn. Money, after all, had become tight. 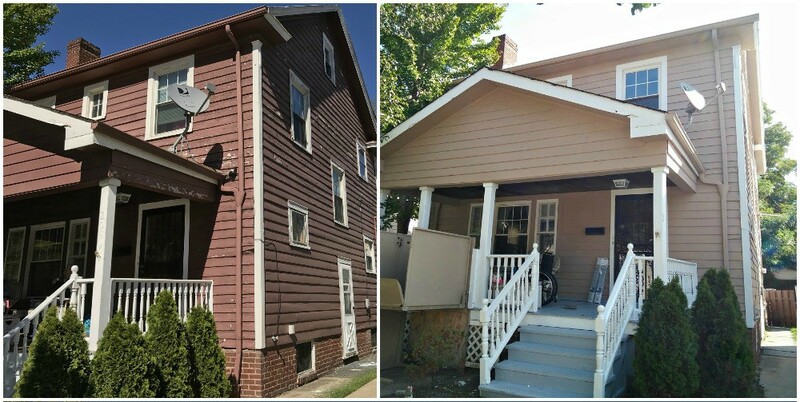 A before-and-after comparison illustrates the sleek “Trusty Tan” paint job now on Ms. Elbur’s home. Ms. Elbur (real name withheld) had quit her job to serve as full-time caretaker for her aging father, a disabled veteran who required around-the-clock care. Together they occupy the nearly century-old colonial Ms. Elbur has lived in all 38 years of her life, coping with his health issues but struggling with home maintenance. When Allison Urbanek, LakewoodAlive’s Housing Outreach Director, learned of Ms. Elbur’s predicament, she knew exactly whom to call. Cindy Friedmann, a LakewoodAlive board member and president of Dependable Painting, did not hesitate to offer assistance when approached by Urbanek. Thanks to Friedmann’s generosity, Dependable Painting donated labor and materials to paint the exterior of Ms. Elbur’s home. It took the union craftsmen 14 man days to complete the job over the course of a week. The crew also expertly handled disposal of the prior lead-based paint. A crew member from Dependable Painting touches up the trim on Ms. Elbur’s home. 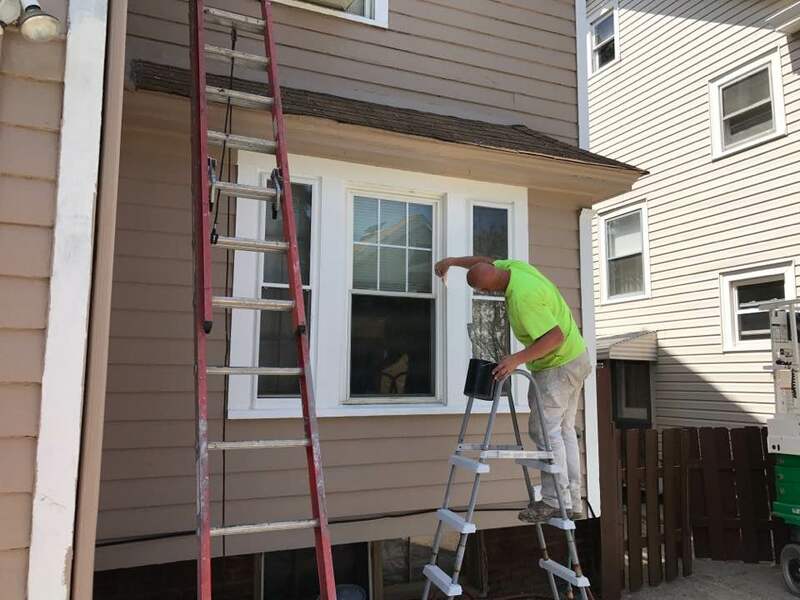 Today peeling paint on Ms. Elbur’s home has been replaced by an attractive color coined “Trusty Tan.” Making the outcome even brighter, Grace Presbyterian Church generously furnished Ms. Elbur and her family with a gift basket containing gift cards and bakery items upon completion of the project. LakewoodAlive’s Housing Outreach program, meanwhile, continues to assist Ms. Elbur with other housing needs, including yard maintenance and mulching. LakewoodAlive’s Housing Outreach Program is designed to offer a one-stop place for residents, both owner occupants and renters, to gain access to services so they are able to live in healthy and safe housing. Through this program, LakewoodAlive fosters and sustains vibrant neighborhoods, one home at a time. For more information please contact Allison Urbanek at aurbanek@lakewoodalive.com.